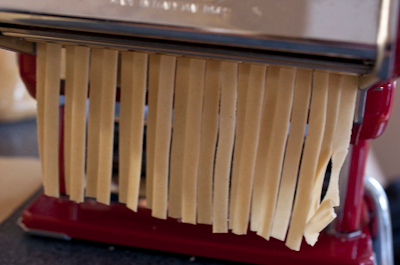 Labor Day Challenge - Fresh Handmade Pasta ~ Learn, Live, and Explore! My friend and I decided that today was the day to try to make our own pasta again. 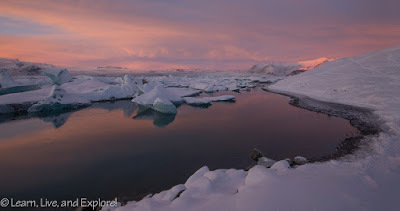 We agreed that it had been a long enough break from the last disastrous attempt! Plus, she had ordered a ridiculous amount of semolina flour from Amazon that was taking up too much room in her kitchen. 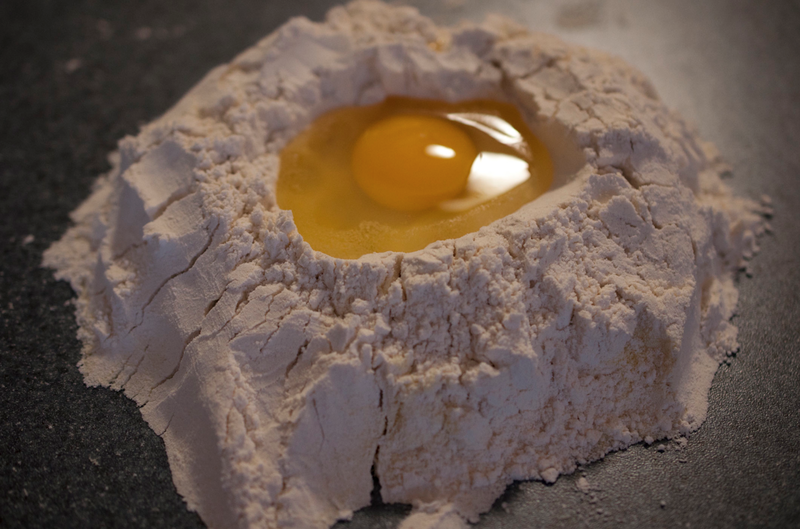 Finding a recipe was interesting because there was no consistency in the amount of flour or the number of eggs. We started off with one generic recipe from Easy Italian Cooking calling for 1 1/2 cups unbleached flour, 1/4 cup semolina flour, 1 tsp salt, 1tsp olive oil, and 2 eggs. Creating our flour well, adding the eggs, and mixing up the dough, we ended up having way too much flour, and were concerned that the dough would be tough to roll, as it was too dry and the elasticity was tight. Wrapping that ball in saran wrap to let rest, we decided that we should try another recipe with more eggs to see if we could get a better consistency. Success! Thanks to Mario Batali. Now it was time to crank the gears into action and make our hunks of dough into deliziosa pasta italiana! To our great pleasure, it turned out that the first dough ball just needed a rest because it, too, rolled out well. 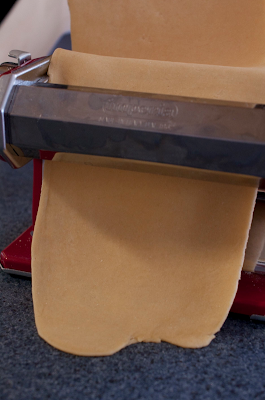 The key to rolling pasta with a hand-cranked machine is to roll the dough multiple times, with each pass through having a narrower setting than before, thereby thinning out the dough. 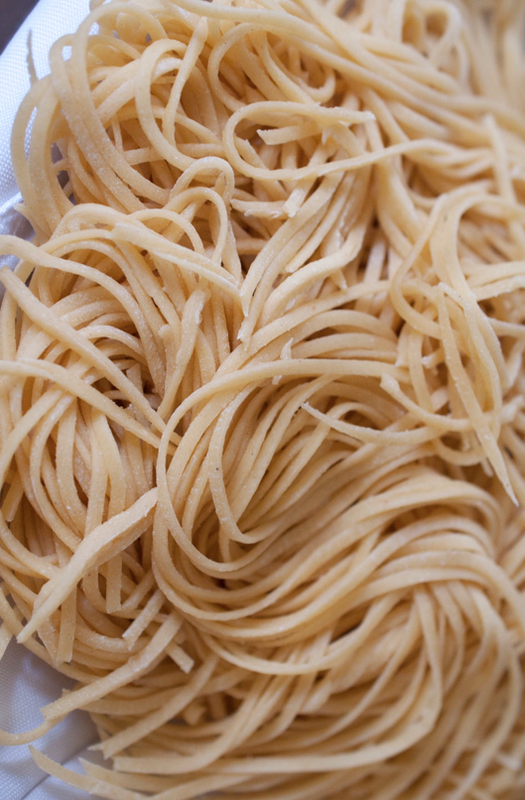 We found that the best thickness for our fettucini and bavetti was a #5 setting. 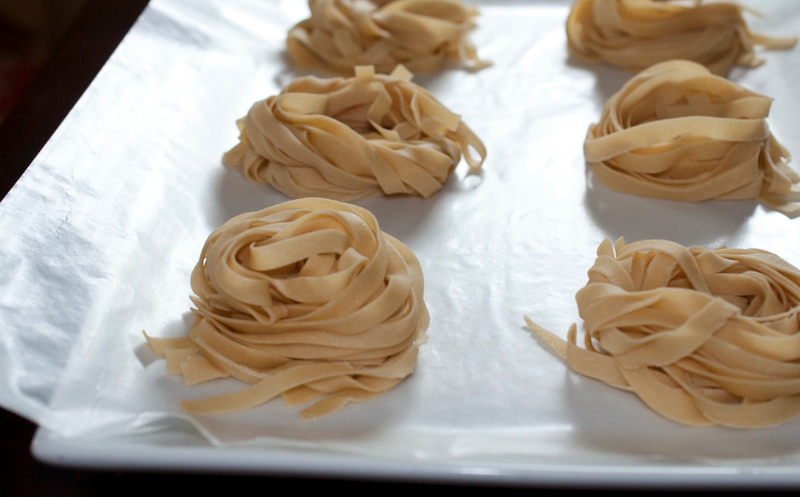 For presentation and storage, we coiled the fettucini into little birds nests. And since the bavetti was for dinner, just tossed that in a bag to be boiled later in the day. I think it's safe to say that we have now passed the test for basic pasta making. Our next challenge will be to make flavored pastas - spinach, saffron, sundried tomato, etc. Until then, BUON APPETITO!